Award show season is in full swing this week, with the Golden Globe award nominations on Dec. 12 and the 2018 SAG Award nominations coming out on Dec. 13. There were plenty of snubs and surprises when the Golden Globe nominations were announced; today’s SAG award nominations look pretty different — and we can get behind it. Here’s how they differ, how they were similar and what left us feeling a lot of feelings. The SAG Awards don’t separate their Best Actress and Best Actor in films by type, meaning drama and comedy get put together unlike with the Golden Globes. This also means that the race is even more intense than might be expected because the competition pool is that much bigger. A closer look at the nominations in these prestigious categories reveals a lot of the same actors are in contention for the big award at both the SAG Awards and the Golden Globes too. Of the five nominees for Best Actress in a Leading Role, Judi Dench (Victoria & Abdul), Sally Hawkins (The Shape of Water), Frances McDormand (Three Billboards Outside Ebbing, Missouri), Margot Robbie (I, Tonya) and Saoirse Ronan (Ladybird) are all nominated for the SAG Awards, just in different categories. The same is nearly true for the Best Actor in a Leading Role category at the SAGs too. Of the five nominees, Timothée Chalamet (Call Me By Your Name), James Franco (The Disaster Artist), Daniel Kaluuya (Get Out), Gary Oldman (Darkest Hour) and Denzel Washington (Roman J. Israel, Esq.) came out on top here, and the only actor not nominated in this similar category at the Golden Globes is Franco. In the Golden Globes, Kumail Nanjiani’s utterly charming romantic dramedy, The Big Sick, was completely snubbed. For the SAG Awards, it snagged a couple of nominations: Holly Hunter for her supporting role performance, and the entire cast for an Outstanding Cast award. Get Out was also passed over for Golden Globe nominations it definitely deserved, and while there are no directing or screenwriting SAG Awards to give writer/director Jordan Peele his due, the film was also nominated for a much-deserved Outstanding Cast award. Wonder Woman, which was the highest-grossing female-directed film of all time, finally scored a nomination — for its stunt ensemble. And Veep, which was also left out of the Golden Globe noms after years of Emmy success, snagged nominations for Best Actress (Julia Louis-Dreyfus) and Best Comedy Ensemble. Just like in the Golden Globes, HBO’s breakout hit Big Little Lies dominated, with nominations for Nicole Kidman, Reese Witherspoon and Shailene Woodley. Laura Dern and Alexander Skarsgård also managed to net SAG nominations for their Big Little Lies work, but failed to make an impact for the Golden Globes nominations. 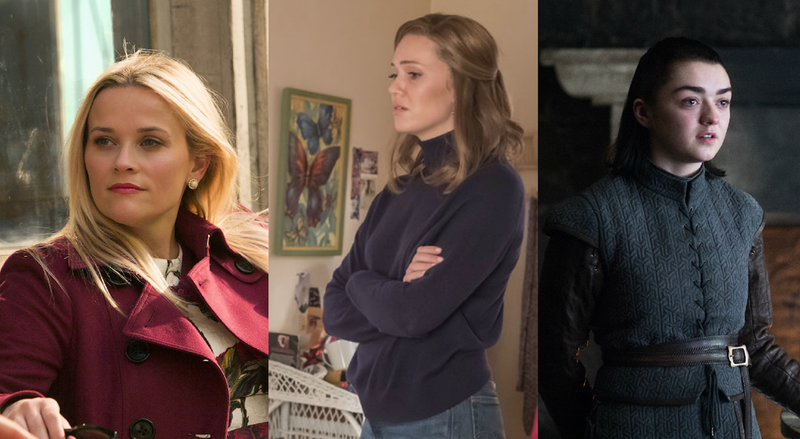 There were few surprises in the SAG Awards Ensemble category, with Game of Thrones, Stranger Things, This Is Us, The Crown and The Handmaid’s Tale getting nominations. And finally, it’s already been announced that Morgan Freeman will get the SAG Life Achievement Award this year. It’s already shaping up to be an exciting award season! Who are your picks to win? Let us know down in the comments.